Burundian president Pierre Nkuruzinza. Photo released under Creative Commons by the World Economic Forum. 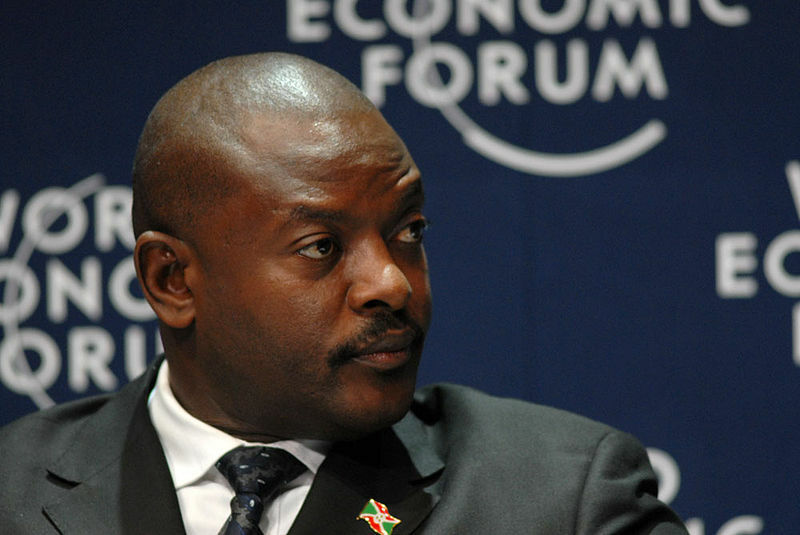 Burundian President Pierre Nkurunziza ‘s attempt to extend his two-term limit  led to mass protests and later an unsuccessful military coup  on May 13, 2015 while he was on a regional meeting in Tanzania. The coup delayed his return to Burundi. A total of 18 African countries  do not have presidential term limits, although new research suggests  that most Africans support two-term presidential term limit. Politicians clinging to power despite the will of the people is no laughing matter, but a little laughter is sometimes just what the doctor ordered. The failed coup in Burundi led to a slew of humorous tweets, especially from Ugandans whose own president is seeking a fifth term . Some created the #NkurunzizaPlaylist hashtag, where they share titles of songs for Nkurunziza. #BurundiCoup  #NkurunzizaPlaylist  If I Could Turn Back The Hands Of Time | R.Kelly. #NkurunzizaPlaylist  – Return of the Mack! Despite the crisis engulfing Burundi, laughter is still the best medicine.